Faith Based Drug Rehabilitation: Can I Come If I Don't Believe Like You? Can an Unbeliever Attend Faith-Based Drug Rehabilitation? 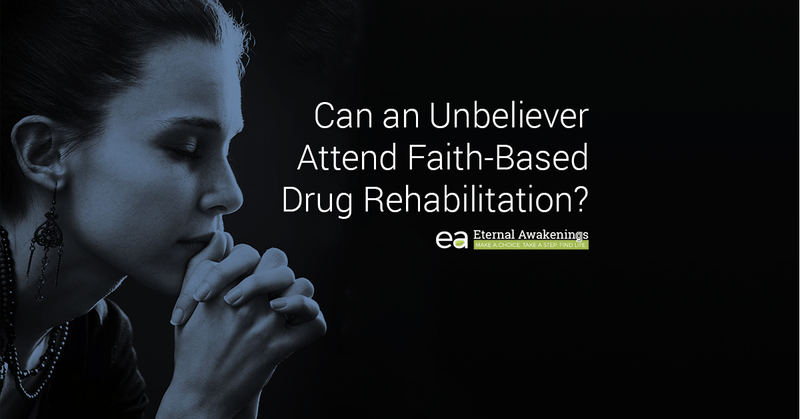 Eternal Awakenings is a Christian drug rehab program, and sometimes, people are not sure if that means that you have to be a Christian to attend here. Can an unbeliever attend our faith-based drug rehabilitation center? The short answer is yes. Anyone is welcome, and you do NOT have to be a Christian to enroll, participate in our program, or graduate. However, we’d like to talk more in depth about this and answer some of the questions you may have about whether faith-based drug rehabilitation might be right for you if you’re not religious or don’t believe in Christ. Will I have to become a Christian as part of your program? No. While our teaching is distinctively Christian, we do not expect or require that you accept or believe the Christian message. While we do require full attendance in all aspects of our rehab program, including church attendance, the content of the teaching itself is presented in a way that you can take it or leave it. Coerced conversions are abhorrent to us and contrary to the nature of Christ and the teachings of the Bible. You can expect us to introduce to you concepts, teachings, and doctrines from the Bible, but you are always free to exercise your own critical reasoning skills and make your own decisions about what you are hearing. A good way to approach any new information that you receive in life is to “eat the meat and spit out the bones.” In other words, retain what is good for you and separate out the parts that don’t work for you. We would encourage you not to dismiss Christian rehab altogether just because you are not a Christian. Many of our residents have come to Eternal Awakenings as unbelievers and have found help and benefit from our rehab program. Will I feel uncomfortable if I am not a Christian while I am in your program? We make every effort to cultivate an environment that is positive, encouraging, and life-giving. In every interaction between staff and residents, we expect people to exercise a mutual goodwill, kindness, and understanding, no matter if there is a difference of belief. Behavior that goes against this standard will not be tolerated, including making fun of someone’s beliefs, belittling others, engaging in hostile lines of questioning, or failing to treat every human being with the basic respect they deserve. Will my rehab be less successful if I don’t live by your faith? When you attend rehab at Eternal Awakenings for your drug or alcohol addiction, you’ll receive a multitude of counseling, help, and teaching on techniques that can assist you to get sober and stay sober. These things will be beneficial to you whether you believe in Christ or not. To the extent that you implement these things into your life, they will bring you success and prosperity in your recovery. However, we will candidly say that we believe that your rehab will be even better if you come to know Christ as part of the program here. Those who have taken this step agree that it was the most important thing they ever did, not just for their addiction recovery, but also for the whole rest of their lives. What if I do have my own faith, but it’s not the Christian faith? We do not bash, demean, belittle, or talk badly about other religions. As a Christian program, it is our business to lift up and focus on Jesus Christ, not to tear down other religions. If you have other beliefs when you come here, be sure that you will be treated respectfully and tactfully at all times. Have any more questions? Ask us in the contact form below! If you’d like to enroll in Eternal Awakenings, please contact us today.